ROWING: In a dominant performance at the World Rowing Championships, Australia secured two back-to-back World Championship titles, along with four silver and one bronze medal. The Men's Four crew of Alexander Hill, Jack Hargreaves, Spencer Turrin and Joshua Hicks held off attacks from both Italy and Great Britain to once again be crowned World Rowing Champions. “It was a good race; we’ve really stepped up through the regatta. We weren’t really happy with our heat, but we got better in our semi and ultimately in the final. I have to say full credit to the other crews who pushed us all the way, but we’re extremely happy to win the World Championships again, it’s been a great year,” Jack Hargreaves said. Australia’s Women’s Four of Molly Goodman, Sarah Hawe, Katrina Werry and Lucy Stephan faced off an in form United States as well as Denmark and Russia. The Australians, coached by Tom Westgarth, had a good start and were chasing the USA, who were in the lead with the Danes and Poland hot on their heels. Ultimately the Aussie team claimed silver with USA taking gold. The Men’s Quadruple Scull, coached by Mark Prater, wrapped up the A-Finals for Australia and did so in style. As the crew approached the final 250 metres, they upped their sprint, to chase Italy and stave off an attack from New Zealand and Ukraine, to cross the line and win a silver medal in what was a photo-finish for the line. “I think we all had the belief we could do it and we really put out a good race. We knew we would be in the hunt for a medal if we were in contact with the leaders at the halfway mark, which we were. I couldn’t believe what the result was when we crossed the line, I’m so over the moon,” added Alex Purnell. Erik Horrie claimed his fifth World Rowing Championships title after a spectacular race for the line against Ukraine’s Roman Polianski in the PR1 Men’s Single Scull. In the process of claiming his World Title, the Australian also broke his own World’s Best Time, crossing the line in a time of 9 minutes 16.90 seconds, some 8 seconds faster than his previous World Record. Australia’s Men’s Eight had a nail-biting finish to their race with the crew of Liam Donald, Rob Black, Angus Moore, Simon Keenan, Nick Purnell, Tim Masters, Josh Booth, Angus Widdicombe and coxswain Kendall Brodie staving off an attack from a fast paced British crew to snap up a silver medal behind Germany who claimed gold. 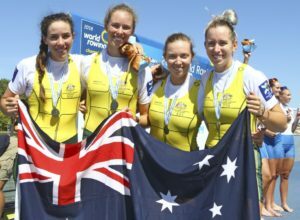 Australia’s Women’s Eight of Leah Saunders, Rosie Popa, Georgie Gotch, Georgie Rowe, Annabelle McIntyre, Ciona Wilson, Jacinta Edmunds, Emma Fessey and coxswain James Rook came home with bronze, Australia’s first medal in the Women’s Eight since 2006. The crew, coached by John Keogh, were leading at the 500 metre mark, before moving into second for the middle thousand with USA taking the lead. Australia’s PR3 Mixed Coxed Four of Nikki Ayers, Alex Vuillermin, Ben Gibson, James Talbot and coxswain Rene Domaschenz, put in a sterling effort in their first ever World Rowing Championships A-Final. The crew, all of whom made their debut at this year’s event, were amongst the medal positions in the first 1000 metres of their final, but it was a fifth place finish for the promising para-rowing crew. The B-Finals also took place today with Australia featuring in three. Australia’s Women’s Pair of Hannah Vermeersch and Addy Dunkley-Smith wrapped up their World Championships ranked eighth in the world, after placing second in their B-Final; meanwhile, Amy James and Sarah Pound finished sixth in their B-Final, ranking 12th overall at the regatta in the Lightweight Women’s Double Scull. The Women’s Quadruple Scull of Olympia Aldersey, Rowena Meredith, Caitlin Cronin and Genevieve Horton won their B-Final in comfortable style to conclude their World Championships ranked seventh in the world. Jack O’Brien and Andrew Judge wrapped up their debut World Rowing Championships, in the Men’s Pair, ranked 13th in the world, while Luke Letcher finished 19th in the World in the Men’s Single Scull. Australia concluded its 2018 World Rowing Championships with two gold medals, four silver medals and one bronze medal, with the country ranked fifth overall on the medal table.